Close to the New Forest in South Hampshire, Southampton is a lively and interesting city which has long been important in the shipping industry. As the biggest city in Hampshire, with the second being nearby Portsmouth, it is a fairly large place with a lot of different districts. The city centre, however, offers plenty to see and do, and the large student population make for it being a vibrant and entertaining place to go out in the evening. Southampton is a very easy city to get to by all sorts of means. It has its own international airport, which is accessible from Southampton Airport Parkway train station, which is, interestingly, the airport station with the least amount of distance to walk to the terminal in the whole country. It also has good train connections to plenty of other cities, and fast trains to London which is just 75 miles away to the North East. The major nearby towns of Portsmouth, Bournemouth and Poole are all also just a short train ride away. Southampton is a popular stop for cruise ships, so a lot of people arrive here or leave from here when they go on Mediterranean cruise holidays, as well as there often being passengers from cruises spending the day here as tourists. One of the things Southampton is best known for is its connections to the Titanic, so if you are visiting for the day, it can be interesting to check out the Titanic museum. This features real artefacts recovered from the sunken vessel, as well as lots of information about the ship and its doomed voyage. There are also other exhibitions relating to the maritime industry that change throughout the year in the museum. Southampton is a pretty good city for shopping, whether you prefer high street bargains, unusual, independent shops, or high end designer brands. The city centre is easy to walk around with a few indoor shopping arcades, so it is generally pretty easy to find what you are looking for and it can be fun to explore the different more unusual shops that are interspersed among the big name brands. If you are looking for entertainment, Southampton’s Guildhall has regular concerts, sometimes by major music acts, whereas the Mayflower theatre is a good place to catch a play. Southampton also has a great nightlife, with plenty of interesting traditional pubs, fashionable bars, lively clubs and diverse international restaurants for you to enjoy. Because of the large student population from the University of Southampton and the Southampton Solent University, most nights are pretty busy in the city centre, even during the week, and you can always find somewhere lively and fun to be. 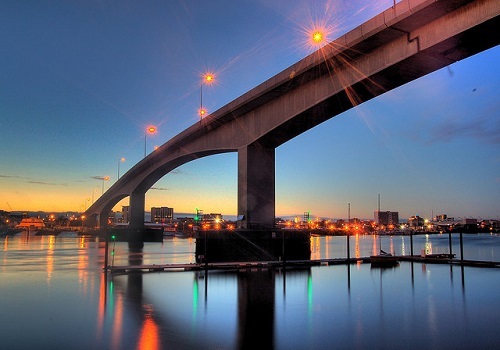 Southampton is a pleasant city to visit with a rich and interesting maritime history. Easily accessible from all over the UK and wider Europe, it can be a fun place to visit if you are planning to explore England’s southern coast, or are looking for a good place for a big night out.